← Pie, it’s what’s for dinner. 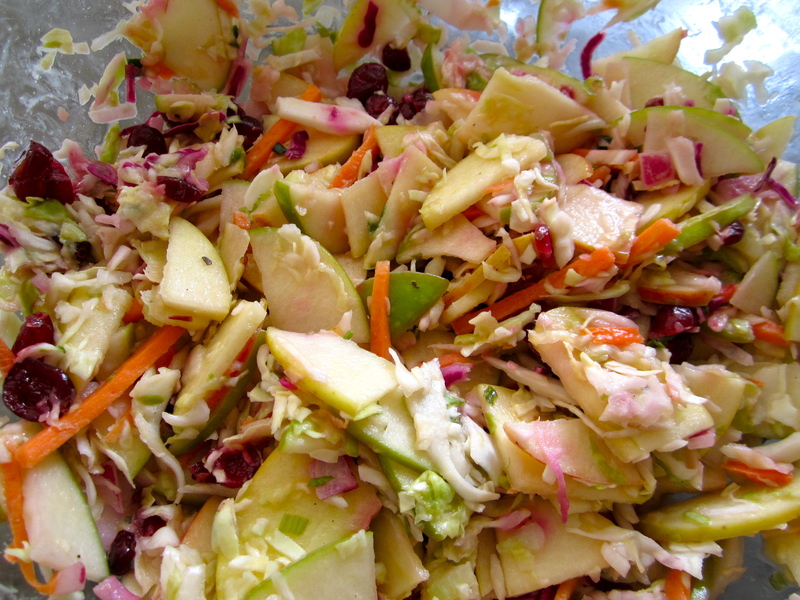 Apple coleslaw is great because it adds a bit of crisp and sweetness to your average cabbage salad. My husband doesn’t like mayonnaise, and he enjoys this dish, but you can adjust the ration of mayo to mustard further depending on your own tastes. I just played around with the ingredients until I got the thumbs up from the hubs. Light mayonnaise, and the use of mustard in place of some of the typical amount (most coleslaw calls for a cup of mayo), cuts down on the fat in this coleslaw recipe. You could also try using a little mayo mixed with greek yogurt to further adjust, but still keep the flavor that mayo brings to the table. If you don’t have a sprayer to use with your lemon juice, just toss the apples with some lemon juice as you cut them so they don’t brown. The response I received at the gathering I took this to was largely from people who don’t typically enjoy coleslaw, but enjoyed this variation. If you ask me, adding in apples is always a bonus! This was for a large crowd at a BBQ, so you could definitely cut it down. Julienne apples and spritz with lemon juice. Put apples in a bowl with other chopped ingredients and half of cabbage. Mix liquid ingredients and add to bowl. As you mix, add in the remaining cabbage. Salt and pepper to taste. I learned at Weight Watchers that if you don’t have lemon juice, you can use a citrus-based soda. Try diet Sprite or diet 7-U; just pour a little over the apples and toss around to coat.